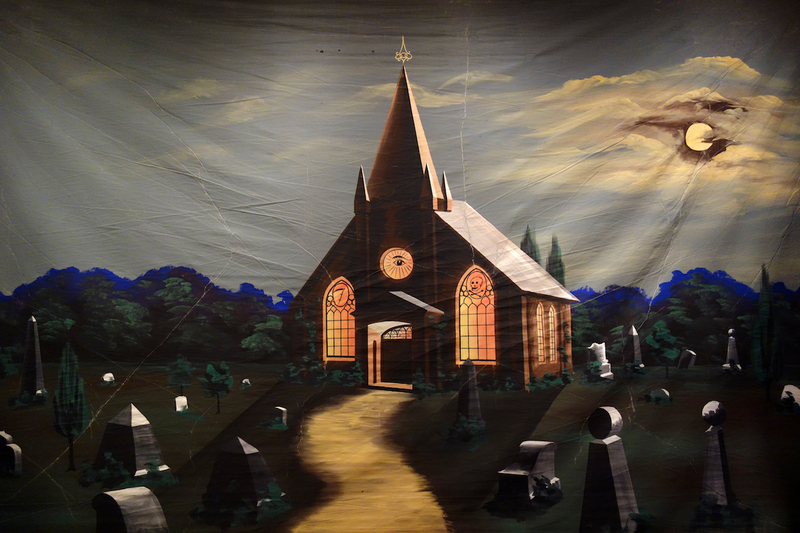 A strange visual language developed from the 18th to the 20th century behind the closed doors of American secret societies. 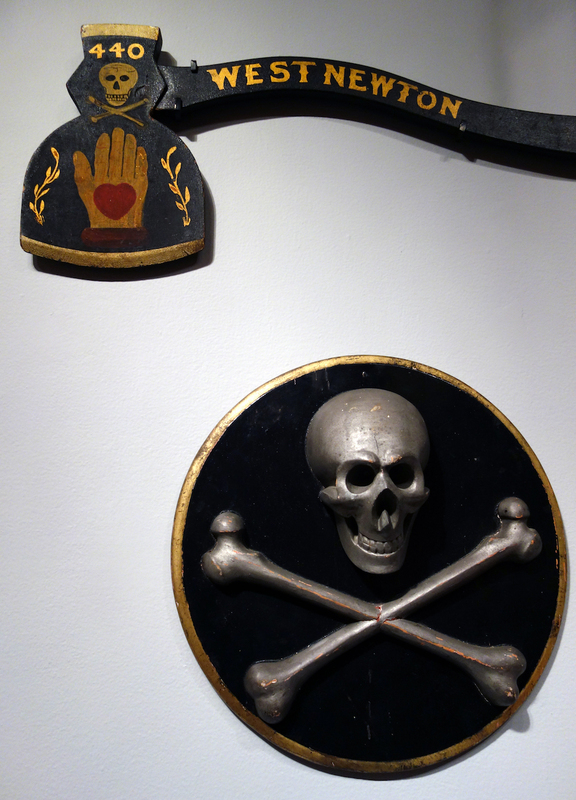 It’s a languae made up of all-seeing eyes, ominous skulls, hourglasses, arrows, axes, and curious hands holding hearts. 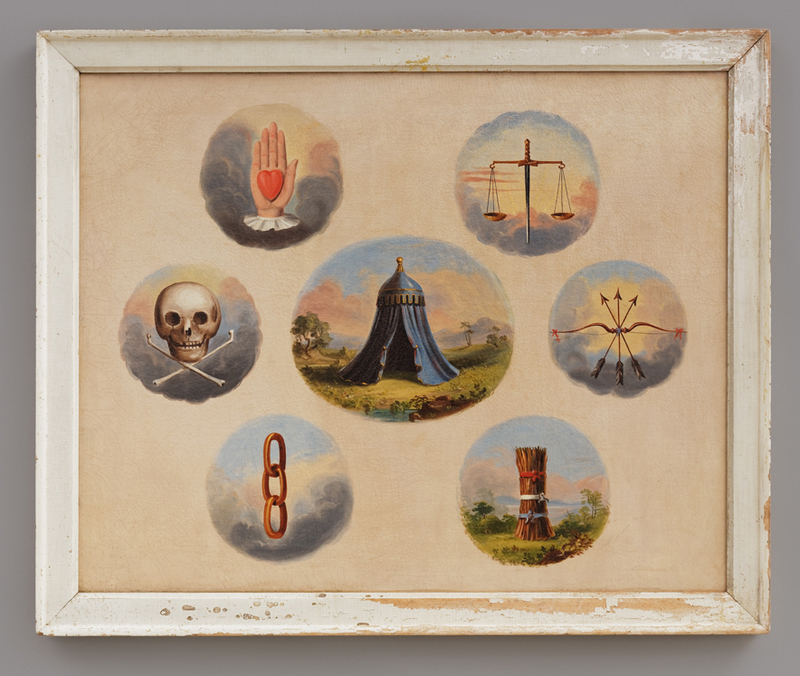 Each of these icons was deeply symbolic for the thousands of people — mostly men — who participated in rituals of borrowed meaning, where ancient Egypt, biblical Christianity, and some homegrown amusements like wooden goats on wheels met the rise of American folk art. 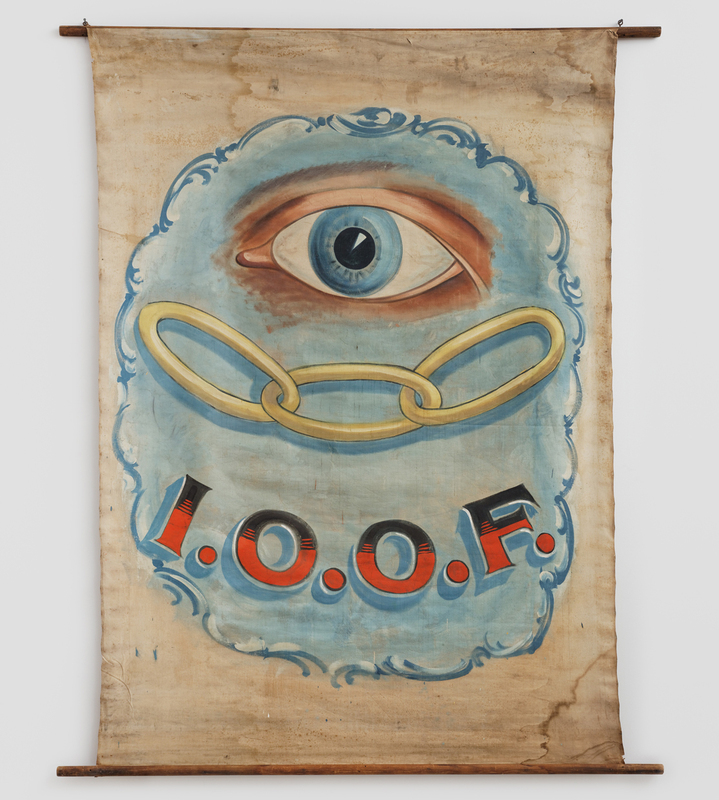 The American Folk Art Museum’s (AFAM) Mystery and Benevolence: Masonic and Odd Fellows Folk Art from the Kendra and Allan Daniel Collection examines this often hidden history through its arcane artifacts. 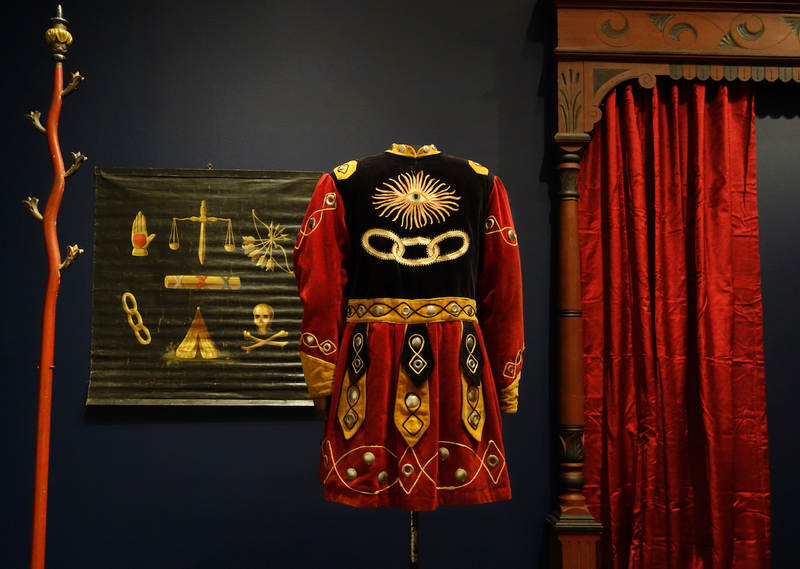 Mystery and Benevolence was curated by Stacy C. Hollander, chief curator and director of exhibitions at AFAM, and Aimee E. Newell, director of collections at the Scottish Rite Masonic Museum and Library. 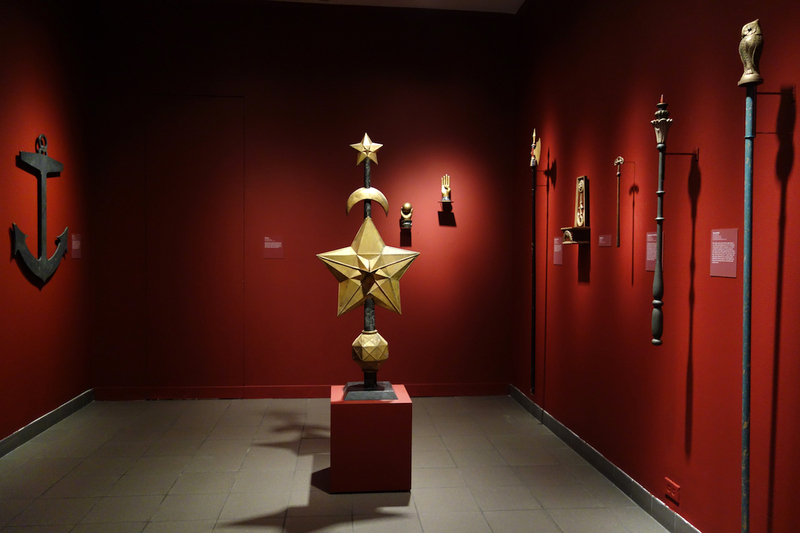 It features over 200 objects recently donated to the museum by Kendra and Allan Daniel, who spent three decades buying up the once-secretive art. 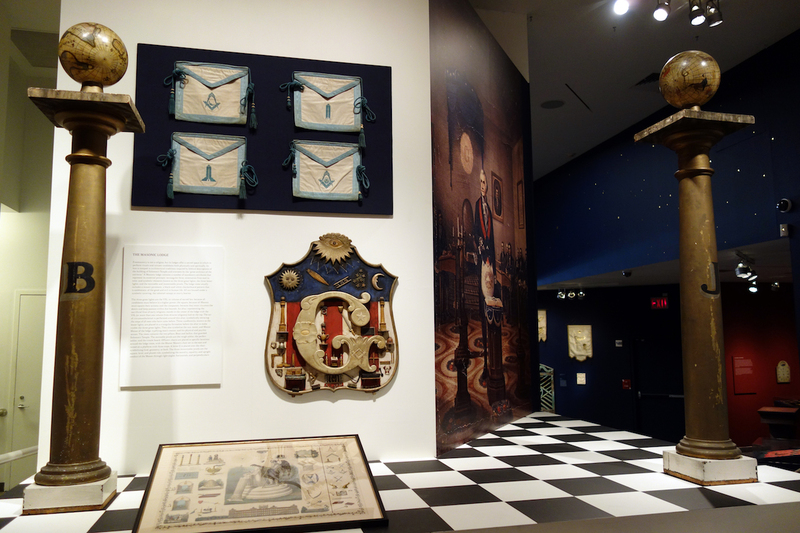 Installed in the museum, the objects are an exuberant display of the “golden age” of Masonic and Odd Fellows objects, when American decorative and folk art merged with the need for a sense of belonging in the new country. Much of the exhibition contextualizes this long-hidden art in the history of the societies, such as their charity work. 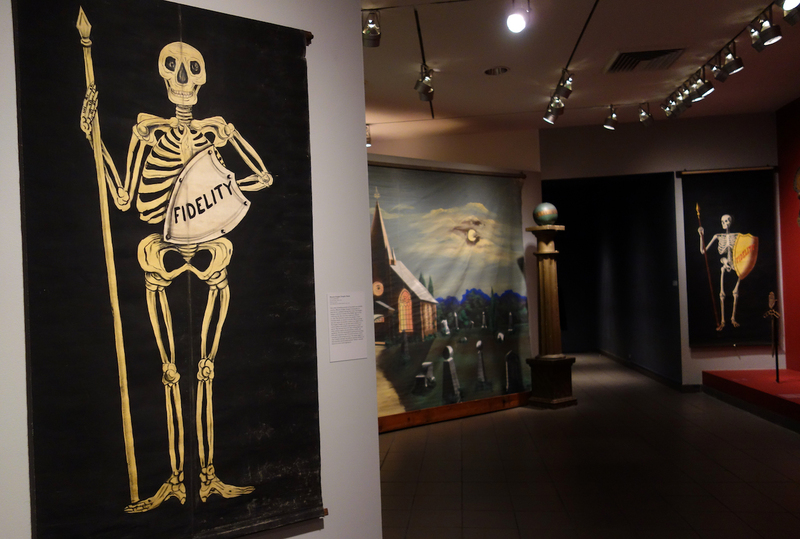 The Odd Fellows, formed in 18th-century London, were organized as a benevolent group to support the sick, orphans, and those who died without money for a funeral. 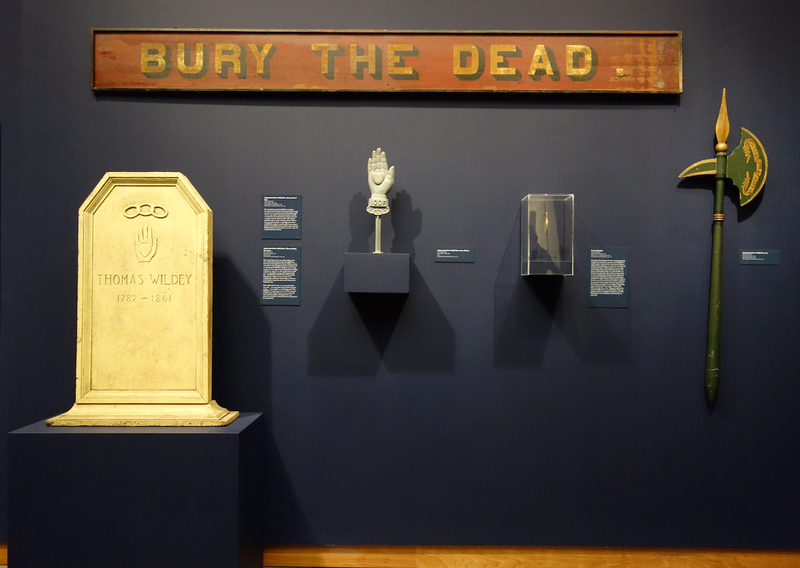 One of their mission statements is proclaimed in red and gold on a large wooden sign: “Bury the Dead.” There are also axes indicating how the Odd Fellows saw themselves as “pioneers in the pathway of life”; staffs topped with a heart in the hand were a reminder to be open to others. In As Above, So Below: Art of the American Fraternal Society, 1850–1930, recently published by the University of Texas Press, it’s noted that from 1890 to 1915, an “estimated one in five men belonged to at least one society.” Fraternal societies still exist, although their numbers have greatly dwindled. According to the Masonic Service Association of North America, there were 1,211,183 members in 2014. 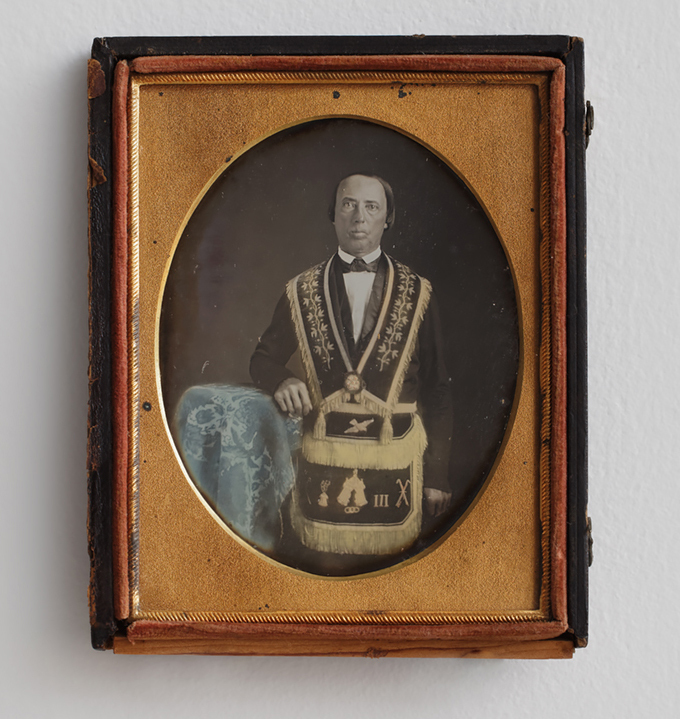 The Masons are the country’s oldest established fraternal order, with numerous lodges founded in the 18th century across the US. 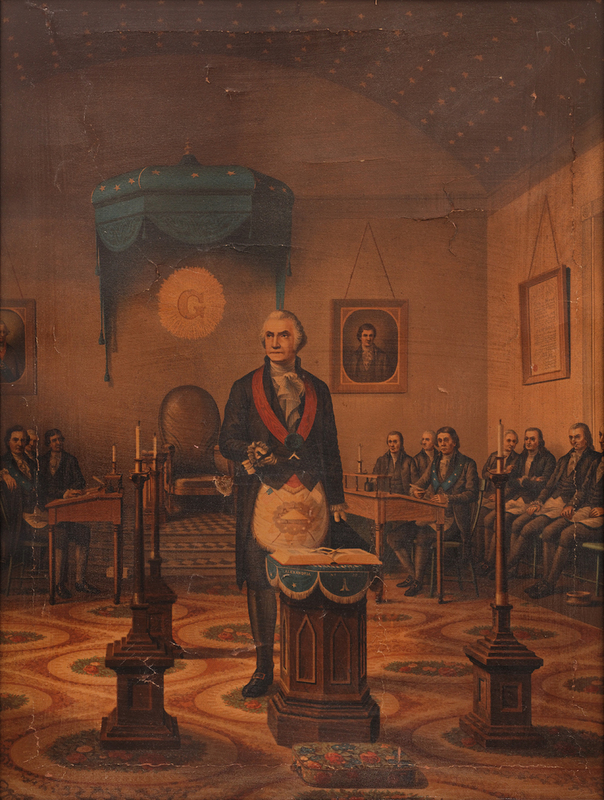 In one painting on view at AFAM, their most famous member, George Washington, stands proudly at a Masonic altar. 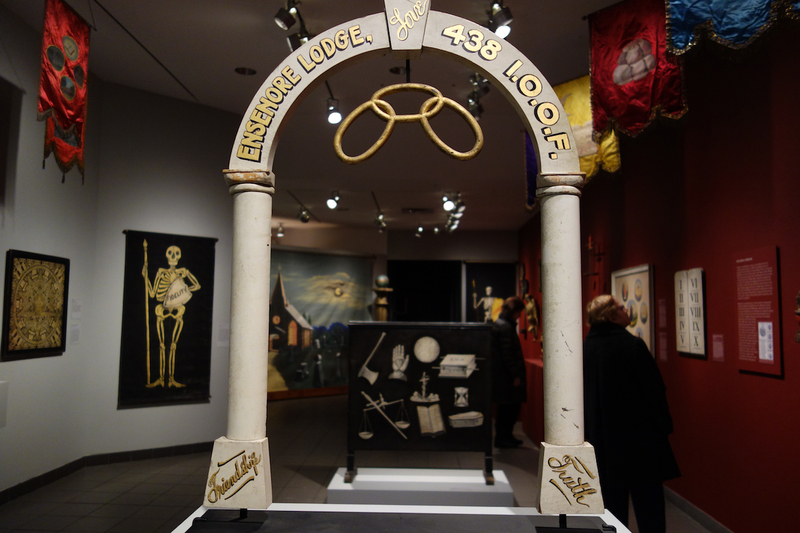 The Odd Fellows soon followed and quickly gained an important membership of their own, as did other societies like the Knights Templar, Shriners, and Junior Order of United American Mechanics. All were mostly white, male, and protestant, albeit from across different economic classes. The objects in Mystery and Benevolence are seductive with their strangeness and feel somehow accessible through the ordinariness of the materials. I remember visiting the Masonic Hall on 23rd Street in Manhattan, and the tour guide (a Mason) pointing out that all the grand architectural flourishes were fancy fakery. The Corinthian columns, the Renaissance murals, and the Gothic arches that adorned different meeting rooms were all plaster — beautifully painted, but mimicry of the exotic and ancient all the same. 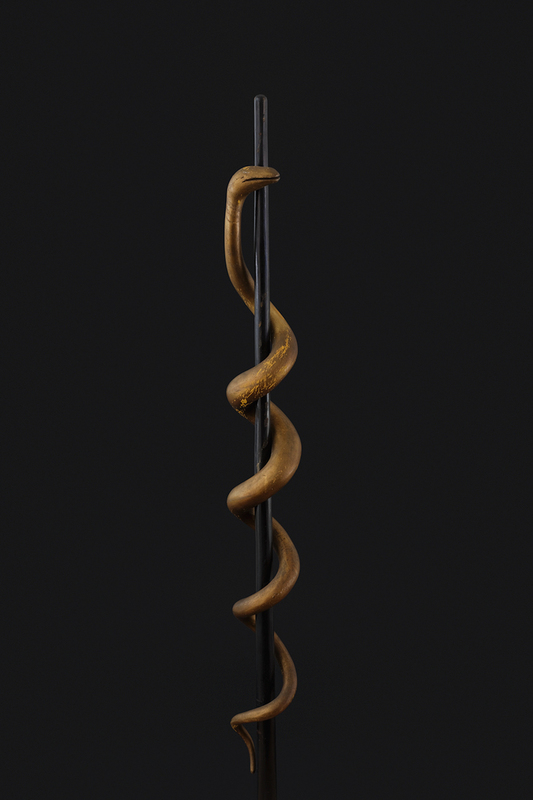 Likewise, the objects in this exhibition are visually stunning, from a late 19th-century staff wrapped with a snake to a towering column topped with a globe. There are some truly masterful pieces, like an intricate marquetry table by James J. Crozier, yet for the most part, the artists remain unidentified and the closest an object gets to a precious material is in the application of some gold leaf on the edges. 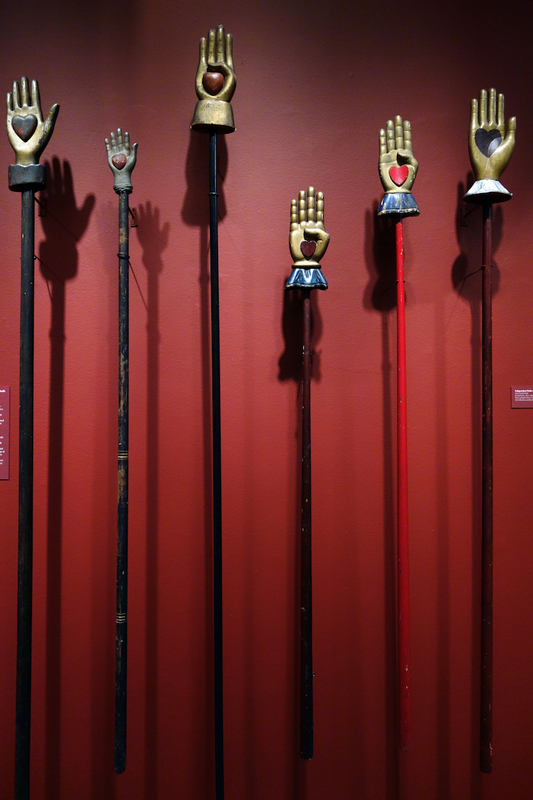 These are rare artifacts of an occult culture, each a labor of love for their ritual purpose, not originally intended as art, but as a tool of connection through shared rites. 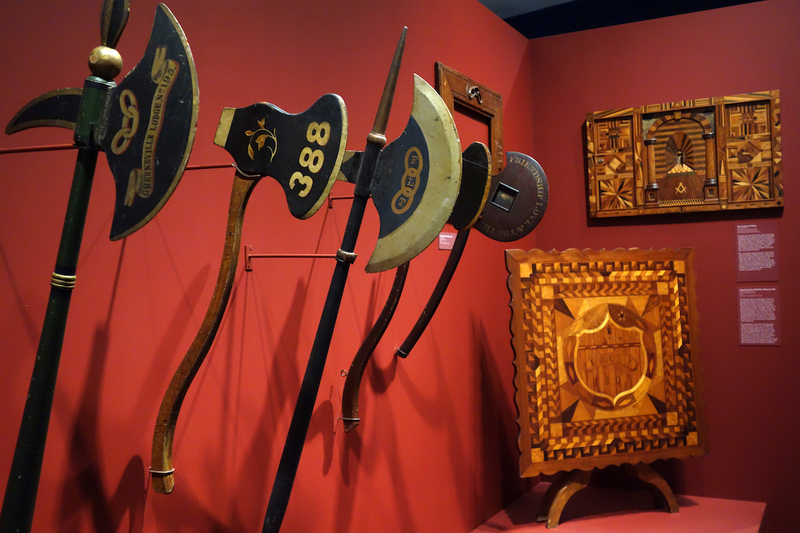 The value of these pieces goes beyond their folk art status. 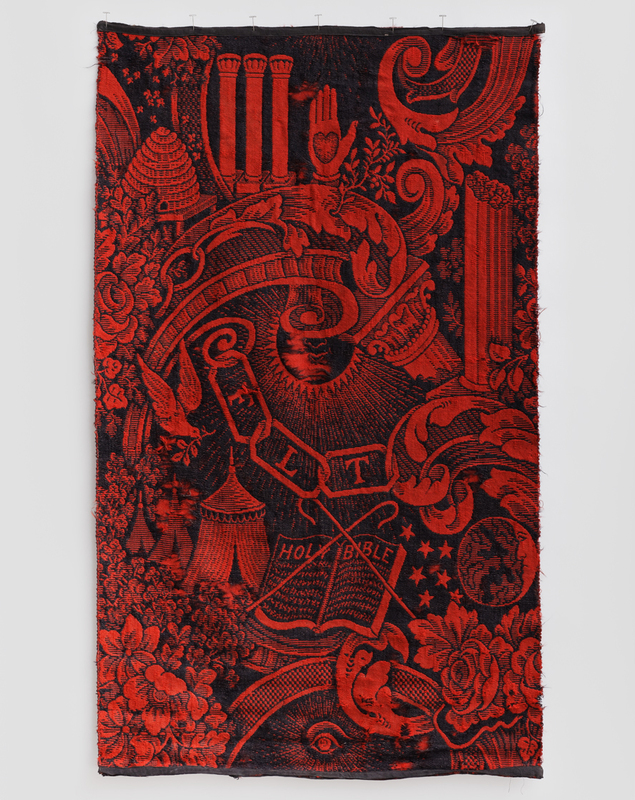 They represent a clandestine history embedded within the story of the United States, where for decades a large percentage of its men would amble over to the local lodge after dark, have a drink (or several), don a scarlet robe, then ponder a skeletal memento mori — or take a ride on a wooden goat around the lodge room. 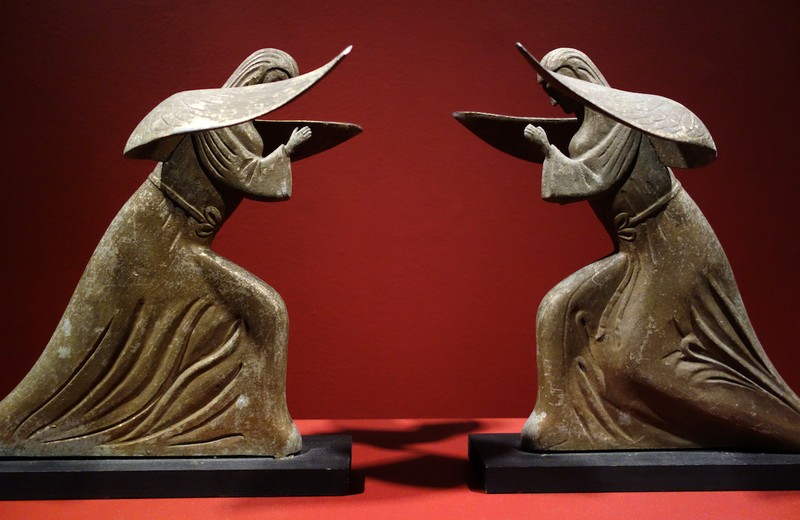 Pair of Cherubim, artist unidentified (United States, 1900–25), metal with traces of gold leaf. They likely were once on a replica of the Ark of the Covenant. 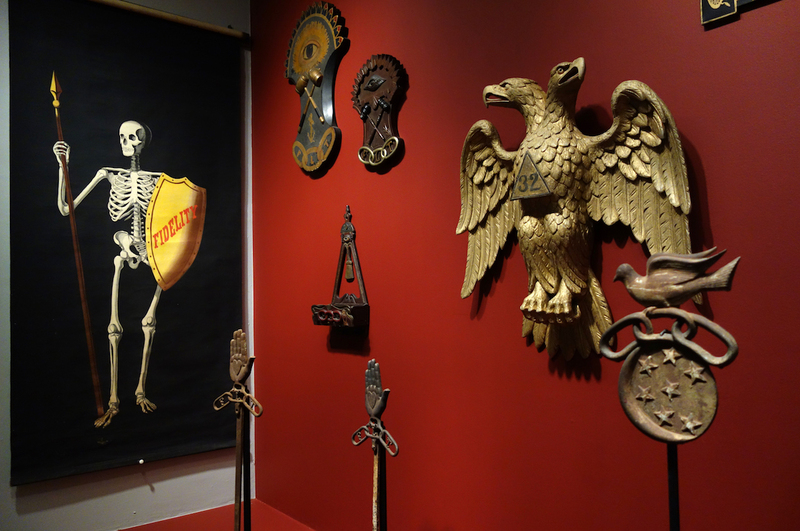 Mystery and Benevolence: Masonic and Odd Fellows Folk Art from the Kendra and Allan Daniel Collection continues at the American Folk Art Museum (2 Lincoln Square, Upper West Side, Manhattan) through May 8.